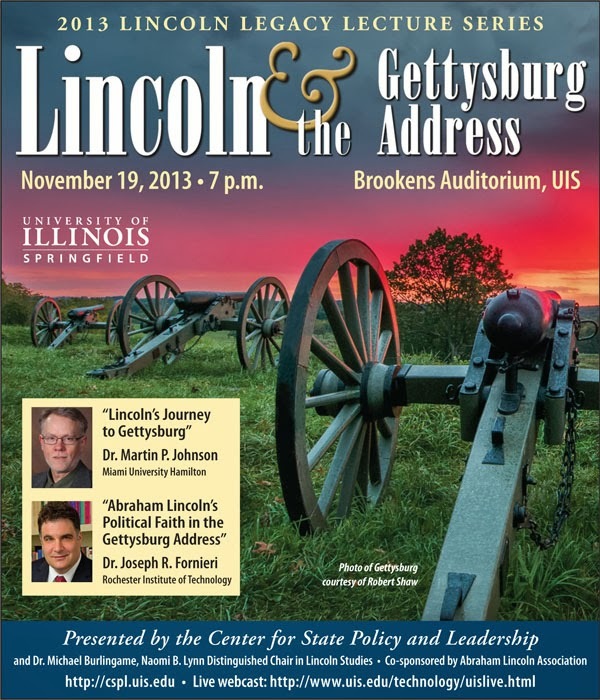 The 11th Annual Lincoln Legacy Lectures presented by the University of Illinois Springfield will be held from 7 to 9 p.m. Tuesday, November 19, 2013 in Brookens Auditorium, located on the lower level of Brookens Library at UIS. This year’s topic is “Lincoln and the Gettysburg Address”, commemorating the 150th anniversary of Lincoln’s immortal speech. The lectures, and a reception and book signing that will immediately follow, are free and open to the public. No reservation is required. This year’s featured speakers are Dr. Martin P. Johnson, assistant professor of history, Miami University-Hamilton, and Dr. Joseph R. Fornieri, professor of political science and Director of the Center of Statesmanship, Law, and Liberty at Rochester Institute of Technology. 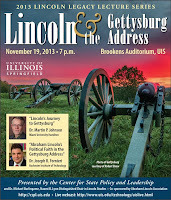 Dr. Michael Burlingame, Chancellor Naomi B. Lynn Distinguished Chair in Lincoln Studies at UIS, will give opening remarks on the relevance of the Gettysburg Address for Americans today, and serve as moderator. Johnson’s lecture will discuss “Lincoln’s Journey to Gettysburg”, tracing Lincoln’s new vision of the American experiment in the words of his speech. In his lecture, “Abraham Lincoln’s Political Faith in the Gettysburg Address”, Fornieri will consider Lincoln’s statesmanship in preserving the nation’s political faith at Gettysburg and the meaning of its “new birth of freedom” in defending, affirming, and extending the Founders’ legacy of equality and self-government. Johnson’s research has focused on the American Civil War and the politics of the Lincoln Administration. His most recent book, Writing the Gettysburg Address (University Press of Kansas, 2013) resolves longstanding mysteries about how Lincoln wrote his most admired speech. Fornieri is the author of several books on Lincoln’s political thought including Abraham Lincoln’s Political Faith (Northern Illinois University Press, 2005) that explores Lincoln’s religion and politics. Burlingame and central Illinois photographer Robert Shaw have collaborated on a new book, A Day Long to Be Remembered – Lincoln in Gettysburg (Firelight Publishing, 2013). Slides of Shaw’s photographs of Gettysburg will be shown before the lectures begin at 7:00 and the book will be available for purchase after the program. The Lincoln Legacy Lecture Series is sponsored by the UIS Center for State Policy and Leadership in cooperation with the Lynn Chair in Lincoln Studies. Cosponsors of this year's event are the Abraham Lincoln Association, College of Liberal Arts and Sciences, College of Public Affairs and Administration, Shelby Cullom Davis Charitable Fund, Engaged Citizenship Speaker Series, Jim and Linda Gobberdiel, Illinois Issues, Illinois State Library, University of Illinois Alumni Association, and WUIS Public Radio. Seating in Brookens Auditorium is limited; however overflow seating will be available in the Public Affairs Center, Level 1, Conference Room C/D, where the audience can watch a large-screen live video feed. Those unable to attend in person can watch a live webcast by going to www.uis.edu/technology/uislive.html at the time of the event. For more information, contact the Center for State Policy and Leadership at 217/206-7094. WHAT: The University of Illinois Springfield presents the 36th annual International Festival with the theme “Passport to the World”. 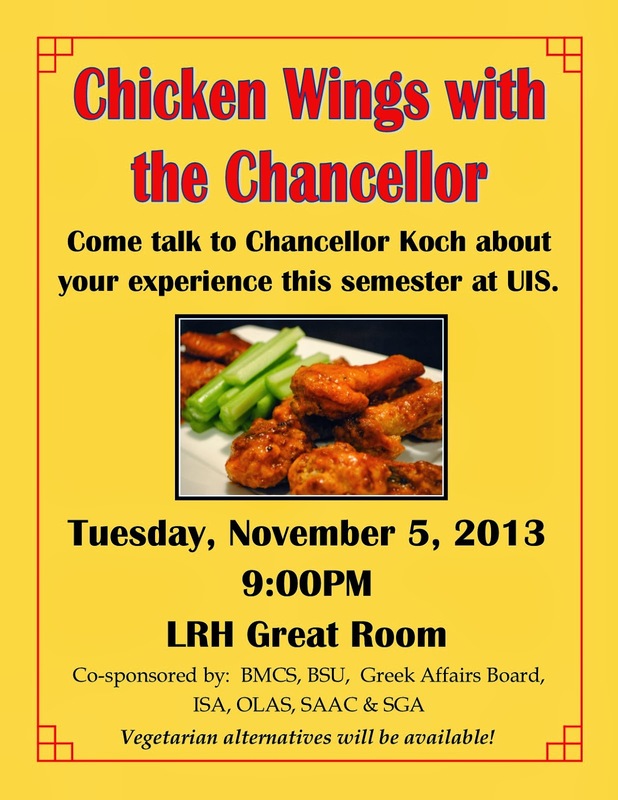 WHEN: Friday, November 15, 2013 from 5-8 p.m.
WHERE: Student Life Building (SLB), located on the east side of the UIS campus. Parking is available in lot B, located next to SLB. A map of campus is available at www.uis.edu/maps/. DETAILS: For over 35 years, the University of Illinois Springfield family has celebrated its rich international and cultural diversity with the annual International Festival. Some of our friends from the greater Springfield community will be joining UIS students, faculty, and staff to share an evening of cultural exhibits, artistic performances, food tasting. This is a free admission event and is open to public. Countries and organizations that will be represented include African countries, China, India, Ireland, Peru, Turkey, Scotland and more. Some of the delicious ethnic dishes you will have a chance to sample will be donated by The Holy Land Diner, Dynasty Asian Cuisine, Hunan Chinese Restaurant, Osaka, La Fiesta, Xochimilico, Olive Garden, and more. When you arrive be sure to pick up a program and a UIS International Festival Passport kit. You will have a chance to explore our showcase of the globe while making your own UIS festival passport as you pick up different exhibition pages during your visit. WHAT: The Illinois Innocence Project will welcome Audrey Edmunds to the University of Illinois Springfield campus to tell the story of her exoneration for a conviction based on Shaken Baby Syndrome (SBS). In 1996, Edmunds was wrongly convicted of first degree reckless homicide after a child she was babysitting died in her care. Her conviction was later overturned after science proved her innocence. WHEN: Tuesday, November 12, 2013 at 6:30 p.m. DETAILS: Audrey Edmunds was a happily married young mother of two with a baby on the way; the neighborhood soccer mom in a small Wisconsin town provided casual childcare when the unthinkable happened. An infant died in her care at the same time the unknown science of Shaken Baby Syndrome was being accepted within the medical community. Based on the diagnosis of SBS by local doctors, Edmunds was accused of killing the child by shaking it to death. She was stripped from her children and husband and sent to prison where she would fight for freedom for 13 years before she was finally exonerated after updated science demonstrated her innocence. Edmund’s story is similar to that of Pamela Jacobazzi who the Illinois Innocence Project is representing. Jacobazzi, too, was convicted of shaking a baby to death based on SBS, again at a time when there was limited awareness of questions about the diagnosis. Edmunds’s story has been featured in many national newspapers and television programs. She recently released the book It happened to Audrey: A Terrifying Journey from Loving Mom to Accused Baby Killer and will have copies available to sign at the event. Edmunds will also speak at U of I College of Law, 504 E. Pennsylvania Ave. in Champaign, on November 13 at Noon. 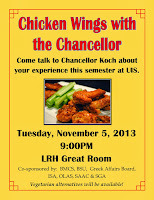 UIS Speaker Series presents "Out Europe! : Discussion and Concert by Greece's Leading Rebetika Musicians"
WHAT: The University of Illinois Springfield Engaged Citizenship Common Experience (ECCE) Speakers Series presents “Out Europe! : Discussion and Concert by Greece’s Leading Rebetika Musicians.” Yona Stamatis, assistant professor of music at the University of Illinois Springfield, will lead the discussion, followed by a rebetika performance by the Rebetiki Istoria Band, the leading rebetika group in Greece, featuring Pavlos Vassiliou, Evangelos Nikolaidis, and Nikolaos Menegas. WHEN: Wednesday, November 20, 2013 at 7:00 p.m. DETAILS: The Rebetiki Istoria Band performs an urban popular song genre, rebetika, in its complex early twentieth century style. This group is unique in its politicization of the music as a means of resisting the Europeanization of Greek Culture. Vassilious is a leading rebetiko musician in Greece and owner of the best-known rebetiko tavern. In 2011, he was awarded the King, Chavez, Parks Visiting Professorship by the University of Michigan for his contribution to the diversity of social and cultural perspectives in Greece and abroad. Stamatis received her doctorate in Ethnomusicology from the University of Michigan in 2011 with a focus on rebetiko music of Greece. Her research consisted of spending three years in Athens performing bouzouki and violin with Rebetiki Istoria and writing about the effects of the economic crisis on musical practice. Stamatis teaches music courses at the university while directing the UIS Chamber Orchestra and playing violin with the Illinois Symphony Orchestra. 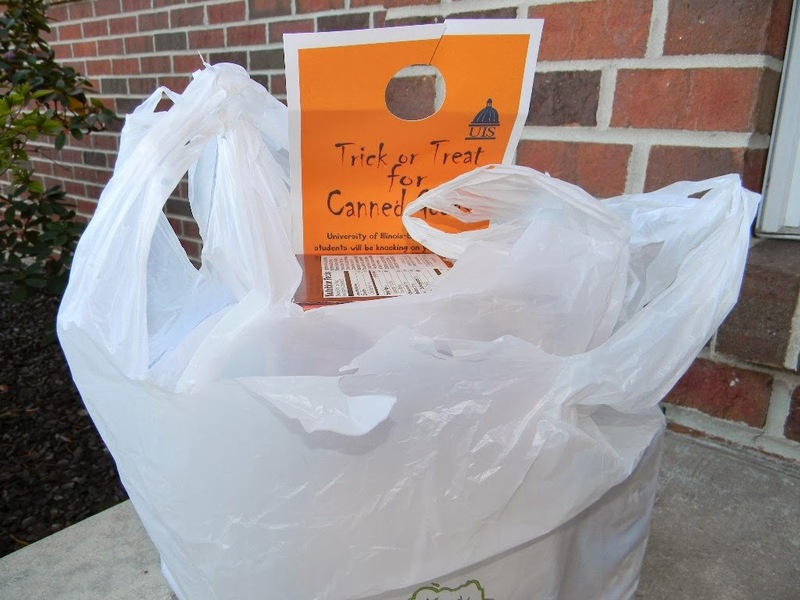 WHAT: University of Illinois Springfield students will be going door-to-door on Halloween night collecting canned goods for the Central Illinois Foodbank. The goal is to collect more than 7,000 pounds of food. WHEN: Thursday, October 31, 2013 from 4:30 to 8 p.m. 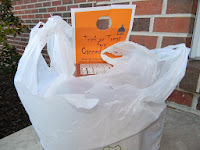 DETAILS: A total of 18 teams, consisting of nearly 230 students, have registered for the annual Trick or Treat for Canned Goods drive. The teams have been assigned specific neighborhoods to collect non-perishable food items. Earlier this month, the teams canvassed the neighborhoods and distributed door hangers that explained the project. Collected items will be returned and weighed at Quaker Steak and Lube following the drive. Prizes will be awarded to the teams that collect the most food during a post-collection party at the restaurant. The Central Illinois Foodbank distributes over 9.5 million pounds of food annually to over 150 food pantries, soup kitchens, residential programs and after-school programs in a 21 county region. UIS Lunch & Learn Series presents "War, Medicine and Remembrance"
WHAT: The University of Illinois Springfield Alumni SAGE Society and Illinois State Historical Society presents “War, Medicine and Remembrance” as part of its annual Lunch and Learn Series. WHEN: Thursday, November 7 from 11:30 a.m. to 1:30 p.m. DETAILS: The year 2014 marks the 100th anniversary of the World War I. Monarchies fell; the “old world” order was greatly damaged; Communism rose; and 37 million soldiers and civilians were killed, wounded or died. The final Lunch & Learn event of the season on “Quilts, Canvas and Women Artists” will take place on December 5. The University of Illinois Springfield recognized scholarship donors during the annual Scholarship Luncheon on October 23, 2013. Over 250 people attended the celebration in the Sangamon Auditorium lobby. For many of the donors it was their first time meeting the students they support. “Each year there are different recipients for the different scholarships, so it’s a chance for our donors of these scholarships to develop new relationships with students as time goes on,” said Jeff Lorber, UIS vice chancellor for development. Lynda Humphrey and her daughter Cathy Humphrey Padget have given several scholarships, including one for athletics, one for legal studies in memory of Lee Humphrey, and one for study abroad. “It’s just such a blessing to see young people and all recipients, whatever age they are try and pursue their goals and have a career. It’s just very exciting,” said Humphrey Padget. One of the Humphrey scholarships benefited senior criminal justice major Jasmine Torres-Gonzalez. She wouldn’t have been able to attend UIS without the support. “The pressure to go to school and the financial strain, it’s really hard. It’s really important to get donors to donate and for those scholarships to keep going,” said Torres-Gonzalez. For donors, such as Brad Ward, creating a scholarship is just another way to pay if forward. Ward graduated from UIS and now has a successful career in higher education. Thanks to donor support, UIS was able to award 265 scholarships during the 2013-14 academic year, which was made possible by 120 individuals, couples, or businesses. “These people need to know that they make a difference, that they change people’s lives and they change society to be a better place to live,” said Lorber. WHAT: The Political Art and the Public Sphere (PAPS) series at the University of Illinois Springfield presents a screening and discussion of the film Examined Life by filmmaker Astra Taylor. WHEN: Monday, October 28, 2013 at 6 p.m. DETAILS: Examined Life brings philosophy back to the streets. Filmmaker Astra Taylor accompanies some of today’s most influential thinkers on a series of excursions through places and spaces that hold particular resonance for them and their ideas. Peter Singer’s thoughts on the ethics of consumption are amplified against the backdrop of Fifth Avenue’s post boutiques. Michael Hardt ponders the nature of revolution while surrounded by symbols of wealth and leisure. Judith Butler strolls through San Francisco’s Mission District questioning our culture’s fixation on individualism. While driving through Manhattan, Cornel West compares philosophy to jazz and blues, reminding us how invigorating a life of the mind can be. 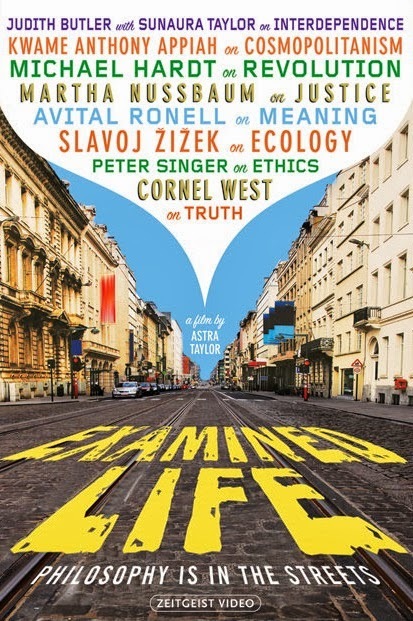 Examined Life reveals philosophy’s power to transform the way we understand the world and our place within it. The PAPS series is a monthly event on the UIS campus hosted by Dr. Richard Gilman-Opalsky, associate professor of Political Philosophy. The theme of the Fall 2013 PAPS series is “Theory in the World”. The series is dedicated to discussions of social and political questions relating to theory and praxis, that is, to the role of thinking in dealing with real problems of economic crisis, war, democracy, and ecology. The Fall 2013 series explores the importance of philosophy for human action in the world. PAPS events are included in the Engaged Citizenship Common Experience (ECCE) Speaker Series. All events are free and open to the public. For more information, contact Dr. Gilman-Opalsky at 217/206-8328 or email rgilm3@uis.edu. 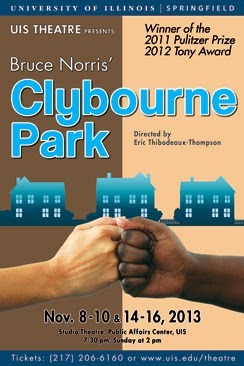 The Theatre Program at the University of Illinois Springfield presents the play Clybourne Park by Bruce Norris, opening Friday, Nov. 8. Six performances will be presented in the Studio Theatre, on the lower level of the Public Affairs Center at UIS - on Friday, Saturday, Sunday, Nov. 8, 9, and 10, and Thursday, Friday, Saturday, Nov. 14, 15, and 16. All shows will begin at 7:30 p.m., except the Sunday performance (Nov. 10), which will begin at 2 p.m. UIS Associate Professor and Director of Theatre Eric Thibodeaux-Thompson will direct the play. Ticket prices are $14 for adults; $12 for senior citizens (65 or older with a picture I.D. ); $10 for UIS Faculty/Staff; $8 for UIS students (and all other college-level students) with a valid, current i-card or college I.D. card; and $6 for 17 and under. Please note that a service charge, not included in the prices above, from Sangamon Auditorium will be added to each ticket price, at the time of purchase. To avoid a higher service charge, buying tickets in person at the Sangamon Auditorium ticket office is highly recommended. For more information, contact Eric Thibodeaux-Thompson at 217/206-6613 or email ethib1@uis.edu, or visit www.uis.edu/theatre. The fourth annual Wepner Symposium on the Lincoln Legacy and Contemporary Scholarship at the University of Illinois Springfield will explore political conflict, polarization, and political hatred in the presidencies of both Abraham Lincoln and Barack Obama. The symposium will be held October 18-19, 2013 in Springfield, Ill. Portions of the symposium will take place on the UIS campus and the Old State Capitol in downtown Springfield. All events are free and open to the general public. Events begin on Friday, October 18 at 9:30 a.m. in the UIS Public Affairs Center, as political scientists explore “Polarization and Political Hatred - Reasoning from History, Social Science, and Common Experience”. Featured speakers include Matthew Holden, University of Illinois Springfield; Chad Newswander, University of South Dakota; Stephen Schwark, University of Illinois Springfield; and Wilbur Rich, Wellesley College. Events will conclude at 5:30 p.m. with a reception in the PAC Restaurant. Day two of the Wepner Symposium begins on Saturday, October 19 at 9 a.m. at the Old State Capitol in downtown Springfield. Political scholars will discuss the “Agenda for Further Learning, Teaching, and Application” until 11 a.m. Featured commentators include James Cornelius, Abraham Lincoln Presidential Library and Museum; Shoon Lio, University of Illinois Springfield, Dan Monroe, Millikin University; and Bert A. Rockman, Purdue University. The symposium brings together scholars from around the country with diverse intellectual backgrounds, from political science to history and economics, and also seeks to bridge the gap between K-12 and university education. For more information on the Wepner Symposium, contact Matthew Holden at 217/206-8519 or mhold3@uis.edu. The symposium can be found online at www.uis.edu/wepner/.